One thing to note: I've done an HSS setup, with 2 x AP11 in the neck and middle positions, and wired them in series to act like a humbucker. The resulting sound was extremely similar to having a C22T in the neck position (which is a great, hot, neck 'bucker). The specs also bear this out. Overall, the AP11 is a fantastic single coil, and definitely a favorite. If you like that sound, look into either a C22T or M22N in split mode in the neck; it's the same sound. The M22N in split has a little more output, and harmonics, IMO, compared to the C22T. The M22V gets a bit thinner/brighter, and gets into the Fender sound nicely. The M22N is just...bigger sounding, in a very good way. If you like an even brighter pickup, honestly, short of actives or EQing, an L500R or C in the neck will be very, very bright, especially when split, and used with 500k or 1M pots. In one of my bolts, I have an R paired with an XL in the bridge, AP11 in the middle, and 1M pots. 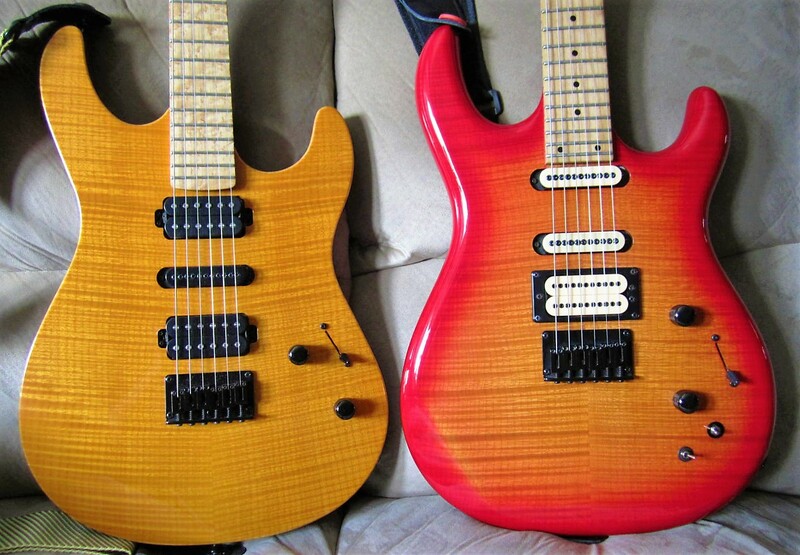 The humbuckers, with both coils on, are brighter than the AP11 (higher frequency/taller resonant peak). In split mode, I have to roll the tone back, otherwise it can get a little nuts, and the bridge gets well into Tele bridge pickup bright. If you add in an inductive tone control (kind of like a Varitone), polarity and coil split switching, and the result is a guitar that has extreme versatility. The only downside with that guitar is the 11.5 lb. weight, but it sounds like nothing else I've played. What is the name of the stain/color on the bolt guitar in the center? That's the old non-DTS Vintage Yellow. That picture isn't a very good representation of it though. 11 pounds! It'd kill me at my age and back condition. I'm also kin to try out the lithium single coils. The Ap11 have a very posative history but everyone seems to love the lithiums. Another piece of hardware I want to try is the Hipsot Bridge. I'm in the middle about the tremolo. Not something I use a lot and even sparingly touch it playing Hendrix songs. But i'm reading it's a pretty stable tremolo and so would be nice to have. My other want is to have it champered. If I delete the bevels that'll help with the weight issue. I'd try the EVO frets if the color I pick went with them but I'll likely keep it natural with maybe an antigue ash treatment. But i am being torn on this with those downright gorgous trans colors with bursts. The weight issue had me dumping my tube amp for a Katana artist. Never thought I'd be playing through a solid state amp but it does nicely. I haven't dumped my pedals. The Katana gives you all the Boss effects but I don't play much with presets stored in memory I got to switch to while playing. (I'm likely upgrading to a Roland Blues Cube after my guitar purchase) I just cannot lug heavy stuff long distances and as you know your doing that quite a lot in clubs or even parked in the driveway of someone's party- if you can even get that close. I'm not the original owner of it...probably the 4th. Everyone else sold it because of weight. I use a 5" wide strap, and, while having had past back issues, I try to keep in shape and lift weights, so this really doesn't feel all that heavy to me. My V6 is 5.5 pounds, and I feel like I'm going to break it. It's also comically small on me. I'm not one to tout the Lithiums. I had a set in my V6. The neck was pretty good, but the M22V was what I wanted. The K12B bothered my ears, and I swapped it for an M22SD. That guitar is done as far as I'm concerned. Those pickups sound great, and have tons of output, yet split well, and clean up when I roll back. Lefty guitars definitely seem harder to come by. I bought my first lefty online about 8 years ago, and have had a lot/hate relationship with it, mostly due to my own frustrations at times, when trying to learn my native hand, despite playing right-handed for 20 years now (and that seems obvious given my lack of skill...always fighting my natural tendencies). 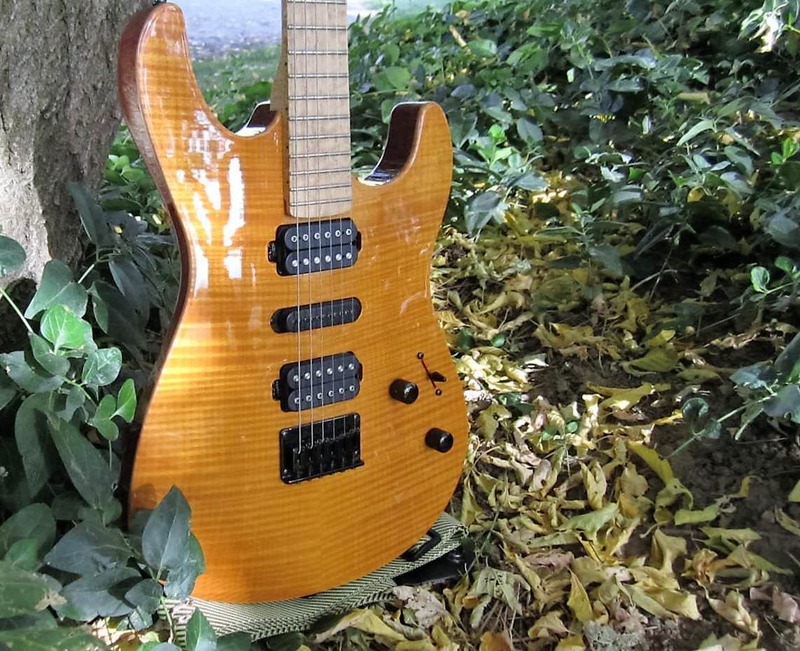 Then-Carvin caught my eye for that, though I didn't have money until much later, either. If I had to go lightweight - A V6X would be my choice, with probably an Atomic Amplifire pedal for modeling/effects, and then powered by a small power amp. Get a ported 1x12 cabinet with a neo-mag'd PA-style speaker (like an Eminence Kappalite 2512), and you'll be keeping up just fine in the volume department. It reminded me of this utube vid which is pretty entertaining. I'm not as bullheaded old school as he is but he does raise a lot of good points. That video makes me chuckle, and get slightly irritated with how he clings to the old school methods and thoughts about so much of a guitar. It's good that he knows what he likes; I think that matters more than the technical specifications, but trying to understand how/why an instrument works can also be helpful in isolating the characteristics that one likes, and how to obtain them Just one man's opinion (and they're all wrong, including this one). I can think of a couple of discontinued models they have brought back. Which ones are you guys and gals aware of? Ultra V, v220 and x220 are the only other ones I can think of off the top of my head. I suppose there was also the ST300 which is the body shape for the jb200c, and originally based on the ST body shape option for the DC line back in the day. spudmunkey wrote: DC150 Sort of. I'd be cool with a modernization over a reissue. Sort of Like the TL60 being reimaged in the Solo. I'd be nice if they did that with the bolt. The GH3 almost does but aside from the 24 frets and the moving of the tone knob it's not really like say ... a Suhr modern. Take a reshape of the Bolt+ like was done with the Solo....losing the pick guard. I guess right now it's the unbeveled aries but that's not a model in itself but an option on a model that isn't.